I was a very inconsistent blogger back then. 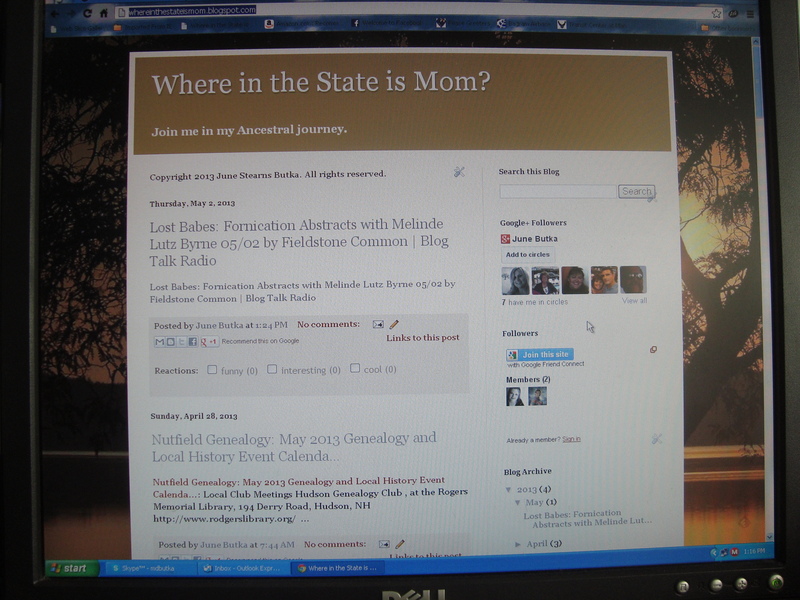 Most of my posts were on the Where in the State is Mom Facebook page. 18 April 2013 was a very important day in my life. I attended NERGC 2013 Special Interest Group (SIG) gathering at the invitation of Heather Rojo Wilkinson. The SIG was about blogging about genealogy. The rest as they say is history. I’m still an inconsistent blogger. I have taken on the challenge to blog the 365 days of June in 2016; as it turns out 2016 is a Leap year, the days of blogging will be 366. I have returned to blog about whatever comes to mind. It may be about the the Historical subjective novel I am writing of Isaac and Mary Stearns decision to come to the Massachusetts Bay Colony in 1630. It might be about my ancestral journey as I search for those who came before me. I could surprise you with where I spent my day; the interesting people I meet along my journey called life; or just something that caught my eye that I think you will find interesting.. Please join me on my life’s journey. today I am posting photographs showing the breath taking view from the 12th floor Presidential Suite of the Raddison Hotel in Manchester, New Hampshire. The New England Genealogist Conference and Expo is going on this weekend. Great workshops, interesting people and lots of goodies at the Expo. The Expo is free to everyone.